Please support your local dealership Harley-Davidson Cyprus by clicking on the link: http://customkings.harley-davidson.com/en_CY?theBikeID=191 and voting for us! What is the ‘BATTLE OF THE KINGS’ CONTEST? Harley-Davidson dealers across Europe are set to compete for the title of top custom bike builder in a winner-takes-all contest based on customizing the latest addition to the Harley range – the Street™ 750. The ‘Battle of the Kings’ contest will involve staff from authorized dealerships across Europe, competing to apply their customization skills to the blank canvas of the Street 750, the newest model in the Harley-Davidson line-up. “Our bike is competing against four customized Street™ 750 motorcycles from Greece, Bulgaria, Croatia and Turkey in this first stage of the South Eastern Europe Regional competition. 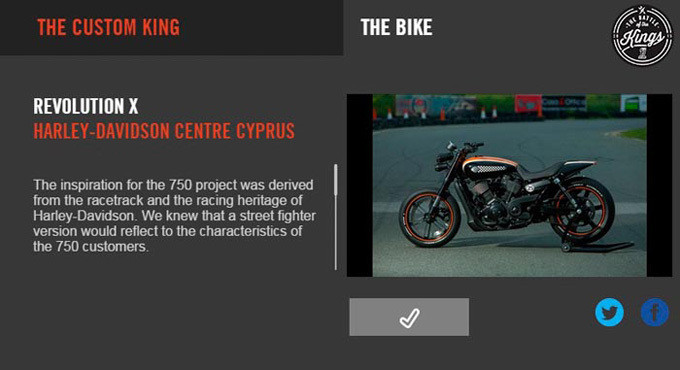 All our Harley-Davidson friends, enthusiasts and fans are kindly requested to visit the webpage and vote for the Street™ 750 REVOLUTION X – Cyprus Participation. The public can vote until the 17th of April 2015”, Iacovos Iacovides says. Voting ends on the 17th of April so don't be late... Start Voting!! !